Islamabad: Former President Asif Ali Zardari Friday expressed his profound sorrow and grief over the death of Naheed Iskandar Mirza, the widow of Iskandar Mirza who passed away in London after protracted illness. 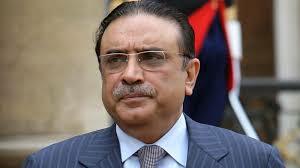 The former President Zardari in a condolence message expressed his sadness and distress with the bereaved family of Naheed Iskandar Mirza. He also prayed for grant of eternal peace to the departed soul and strength and fortitude to the bereaved family to bear this irreparable loss with equanimity.